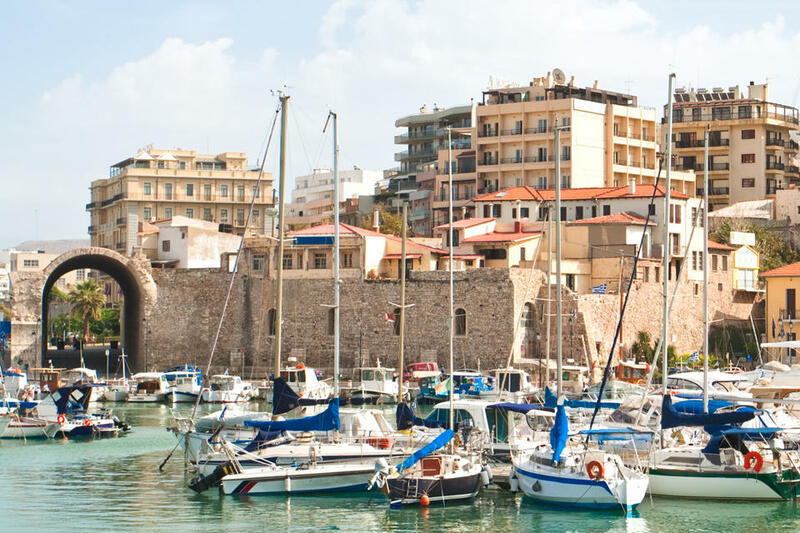 You sail into Heraklion's huge new commercial port, which features 4 piers of various sizes jutting into the water and is enclosed on its north end by a 2 kilometer-long mole running east from the old Venetian harbor. There, a few hundred meters to the west, at the entrance of the tiny Venetian harbor, where the mole begins its long, narrow trek to the east, squats the massive, bevel-sided structure called by the Venetians the Rocca al Mare fortress (Sea Fortress). It's mostly known now by its Turkish name, Koules (Water Tower). A huge, round bastion projects into the harbor from the southeast corner of the rectangular fort. The fort and the city's encircling walls, built by the occupying Venetians, were worthy opponents for would-be conquerors, the proof being that Candia, as Heraklion was known at the time, endured the longest siege in world history. In 1648, the Turks, who had been in a power struggle at the time with the Venetians for mastery of the Eastern Mediterranean for more than 3 centuries, began a siege that lasted until 1669, when Candia fell. That's 21 years. Another way to look at it is like this: a child born at the start of the siege could have grown, married, and started a family by the time it was lifted. The Turks allowed the city's inhabitants to leave alive, but leave they had to. The rest of Crete had fallen to the Turks long before. How the city lasted 21 years is more easily understood with a visit to the Heraklion Historical Museum, which has a room-sized scale model of Candia as it looked in 1645. The houses all have extensive back yards which were used to grow crops, plus a number of open fields which were also cultivated. Water came from the city's 1200 wells and 273 water catchment tanks which collected the winter rains. With a metro area of 225,000, Heraklion is by far the largest city in Crete. It is not the most beautiful. That honor belongs to Chania. But it is an interesting, sprawling place, with lots to see, and lots to do. With respect to that name, "Candia," it is a Latinized version of the Arabic name, "Khandakas," which means "Castle of the Moat." This was the name Andalusian (Spanish) Arabs gave to the new capital of their short-lived Emirate of Crete (820's-961 AD). After their conquest of the island, they moved the capital from the old Roman capital of Gortyn 45 km northeast to the site of Heraklion, built the castle and the moat, and named the place accordingly. The Byzantines re-took Crete in 961, and re-named the city Megalo Kastro (Big Castle). 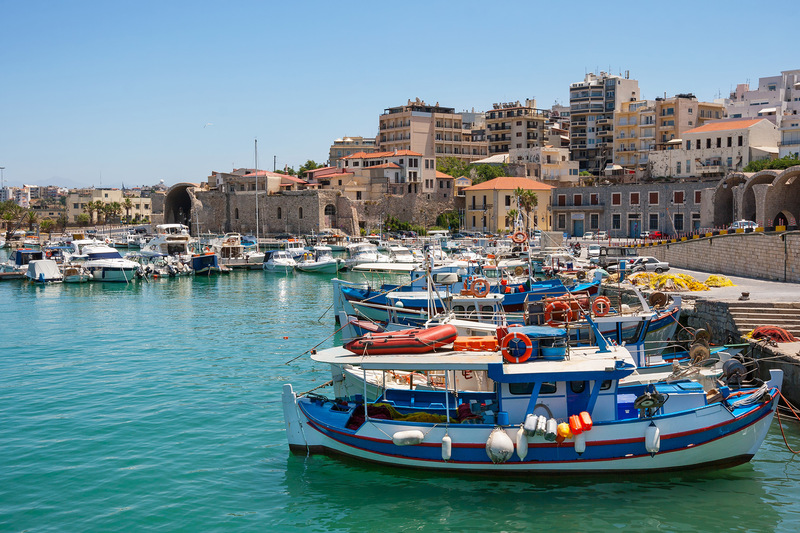 "Heraklion," a name adopted in the 19th century, is a revival of an ancient name for a nearby port whose exact location is unknown. Heraklion, or Iraklion, as it is now increasing being spelled, means "City of Hercules." Just 5 km north of ancient Knossos, which was the largest city in ancient Crete and chief population center of the Minoan era (2600-1600 BC), Heraklion's site probably served as the port for Knossos, although nothing has been found archeologically to indicate that fact. That it is the shortest distance in a straight line to the sea from Knossos says a lot, though. The Andalusian (southern Spanish) Arabs were Muslims who had been expelled from Spain for their constant rebellion against the ruling Emir of Cordoba. After they left Spain they planted themselves in Crete. 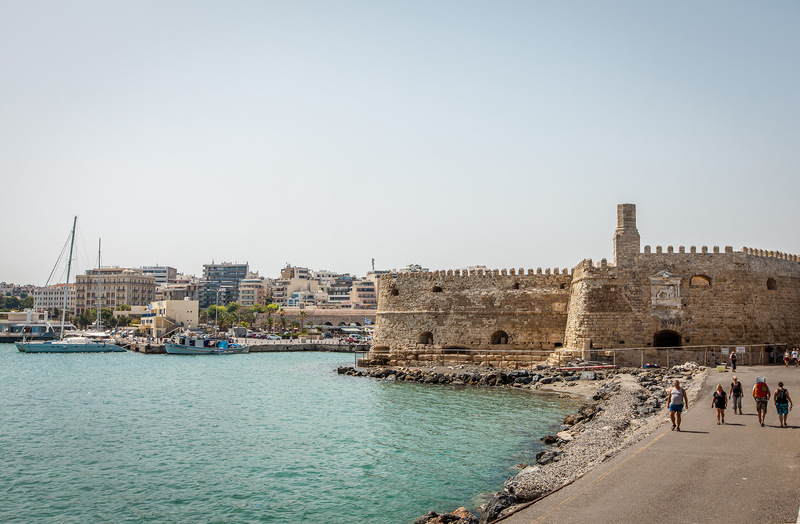 The building of the castle during the 820's marks the founding of the city, making it rather younger than other cities in Crete. The Arabs chose their site well, as evinced by its growth over the centuries to become the island's population center, and the most important port in the Eastern Mediterranean. The Arabs sheltered local pirates who raided Byzantine merchant fleets in the Aegean. In 961, Candia (and Crete) was re-taken by Byzantine commander and future emperor Nikephoros Phokas. The inhabitants were massacred, the city was razed, and a new one was built on the ruins. The Byzantines ruled until 1204, when the Venetians took over Crete, purchasing it after a lot of complex political deal-making with the Byzantines, with the recent 4th Crusade a factor in the negotiations. The Venetians vastly improved the city's fortifications. These still stand, and are truly massive, including city walls that are an unbelievable 40 meters thick in places. The built the Koules fortress at the harbor's mouth. After 440 years of Venetian rule, the Ottomans showed up outside the city gates and began their more than two decades-long siege. The last two years of the siege cost the lives of 70,000 Turks and 67,000 Cretans. Candia's role as a shipping center declined under the 230 years of Ottoman rule because the harbor was allowed to silt up. Maritime commerce shifted over to the harbor of Chania, 125 km to the west. In 1897, Crete rebelled against the Ottoman empire, which caused the great European powers to intervene in the interest of keeping the region stable. The Ottomans approved a Great Power occupation of the island. From 1898-1908, Crete was divided up, occupied and administered by Britain, Russia, Italy and France, with Candia in the British zone. This was when it was re-named Heraklion. In 1908 the process of unification with Greece began, ending in 1913 with the complete withdrawal of European powers. In 1917 Crete's capital was shifted from Chania to Heraklion. Heraklion has expanded greatly beyond its original city walls. Its old city is a much smaller, roughly circular area enclosed by the walls. Its diameter is just over a kilometer, which means its points of interest are all within walking distance. A good point of reference for orienting yourself in the city, and being within a few minutes' walk of any place worth visiting, is the 17th century Lions' Fountain, or, as the locals refer to it, the Leondaria, which sits in the middle of small, triangular-shaped Eleftheriou Venezelou Square (Nobody refers to the square by name, preferring "Leondaria."). Four lions support the fountain's central basin. The official name of the fountain is the Morosoni Fountain, named after the late-17th century Doge (ruler) of Venice, Francesco Morosoni. Morosoni was commander of the Venetian forces which surrendered Candia in 1669 to the Ottoman Turks. He is rather more famous for an event which took place 18 years later: it was his troops which fired the shell into the Parthenon, which the Turks had been using as a powder magazine, instantly turning a structure which, 2000 years after its construction, was still being used as a functional building, into a shattered ruin. Since Morosoni was undoubtedly the one who gave the order to shell the Parthenon, he should have gone down in history with the name "Morosoni the Parthenon Destroyer" if there were more justice in the world. If Lord Elgin's sin of stealing the Parthenon Marbles could be compared to a modern shoplifting infraction, Morosoni's sin looks like the bringing down of the World Trade Center in comparison. The fountain's creation was utilitarian, not decorative. It was the final piece of a project to bring drinking water to Heraklion, which depended until then on rather brackish water wells and rainwater cisterns. The Italians built a 15 kilometer-long aqueduct from Archanes on the slopes of Mt. Juktas. Under the fountain is the reservoir which stored the water from the aqueduct. The water comes out of the lions' mouths without any mechanical aid thanks to the ingenuity of the Italian engineers who designed the system, taking advantage of the difference in altitude between Archanes and the fountain. Everyone knows where the Lions' Fountain is. 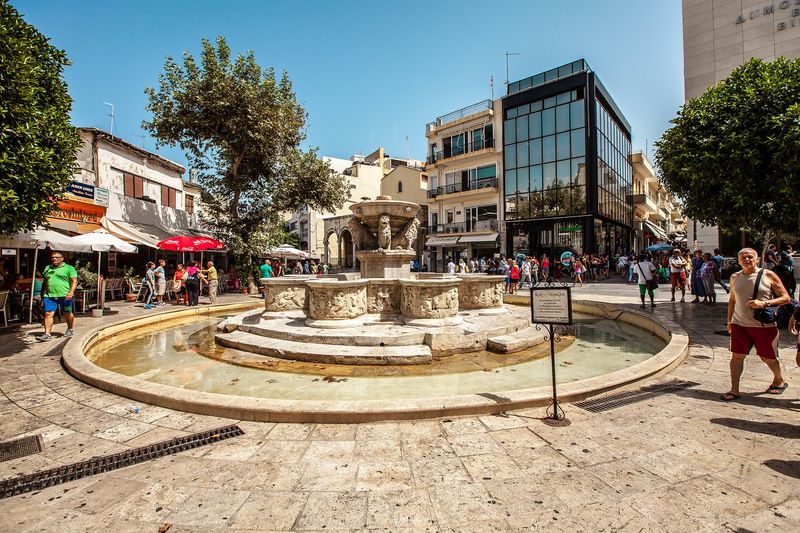 Let's say you start your tour of Heraklion at the fountain and square. It is a busy place, and never quiet during a 24-hour day. You can sit at one of the square's cafes and enjoy a bougatsa (a phyllo-layered sweet filled with creamy custard) and a coffee in the morning and watch people while you catch up on your email. During the day the square fills with passing tourists and locals. In the evening the Leondaria becomes the can't miss it meeting point for those wishing to rendezvous for a night out on the town. Late at night it is a final stopping point after a night of partying, for souvlakia and gyros to help settle the stomachs and bring down the blood alcohol level of the inebriated. Historically, the square was the largest Eastern Mediterranean slave market when the Arabs were in charge during the 9th-10th centuries. During the 10th-13th centuries, the house of the Byzantine governor was located here. During Venetian rule (1204-1664), it was the site of the palace of the Duke of Crete; a block-long, two-story structure on the north side of the square, where the souvlaki shops are now. The Basilica of St. Mark, just opposite the fountain, is one of the most important Venetian structures of Heraklion. It now houses the Municipal Art Gallery. It's open daily. This simple stone building with its arched front portico was built in 1239, early in the rule of Venice over Heraklion, to honor Venice's patron saint. It served as the burial place of Venetian nobles, and as a place for official ceremonies. A clock tower with a bell stood off the SW corner of the Basilica, whose design was based upon the tower in the much larger St. Mark's in Venice. The Ottomans turned it into a mosque. They built a minaret, which was torn down after the liberation of Crete. If you think of the old city as being roughly the shape of a clock face, with the Lions at its center, and you head in the direction of 1 o'clock (NE), you'll be following the route of 25th of August St., which has always been Heraklion's main thoroughfare. It houses the city's largest concentration of neoclassical buildings. The street gets its unusual name from an event which occurred on that day in 1898, which is also the feast of St. Titus, Crete's patron saint. A mob of Muslims, angered at the loss of Crete to the caretaker government of European powers, went on a rampage, killing many Christians, 17 British soldiers, and the British Consul. After about a hundred meters along 25th of August St. you'll come to the Venetian Loggia, a 2-story rectangular Italian structure demarcated by parallel rows of arches on both floors, with an arcade on the ground floor. It now hosts the Heraklion City Hall. It's original function was that of a meeting place and private club for the Venetian nobles, rulers, and feudal lords in Heraklion and greater Crete. In addition to social activities, the Loggia served as an administrative center, where proposals were discussed and decisions made regarding the day to day aspects of governing Crete. The Duke would station himself on the upper story balcony to review parades and religious processions. Decrees and announcements were proclaimed from the balcony as well. The loggia is a copy of the much larger Palladio’s Basilica in Vincenza (just west of Venice). The consensus is that the Loggia is the best Venetian building in Crete. It was restored during the mid-20th century, and in 1987 it won an award for the most successful restoration of a European monument. Across from the Loggia is Theokotopoulo Park, the largest green space in the old city center. In the park there is a bust of Spanish Renaissance painter and Heraklion native, El Greco, whose name in Greek was Dominicos Theotokopoulos. Just after the Loggia, continuing up 25th of August street, is the Church of Saint Titus. Titus was a disciple of St. Paul and the first Bishop of Crete. A book of the New Testament is named after him. His skull, venerated as a relic, was moved from the original church of St. Titus, in Gortyn, to the new one after the ancient capital was destroyed by the Arabs, and the new church of St. Titus in Heraklion was built. The present structure was rebuilt in 1856 after the original was destroyed by an earthquake. If you continue up 25th of August St., after 300 meters you'll come to the Venetian harbor and the fortress of Koules. The Venetian Harbor is only a small portion of the Heraklion waterfront, most of which is taken up by the rather plain, unattractive expanse of the new port. The fortress of Koules is the emblem of Heraklion. 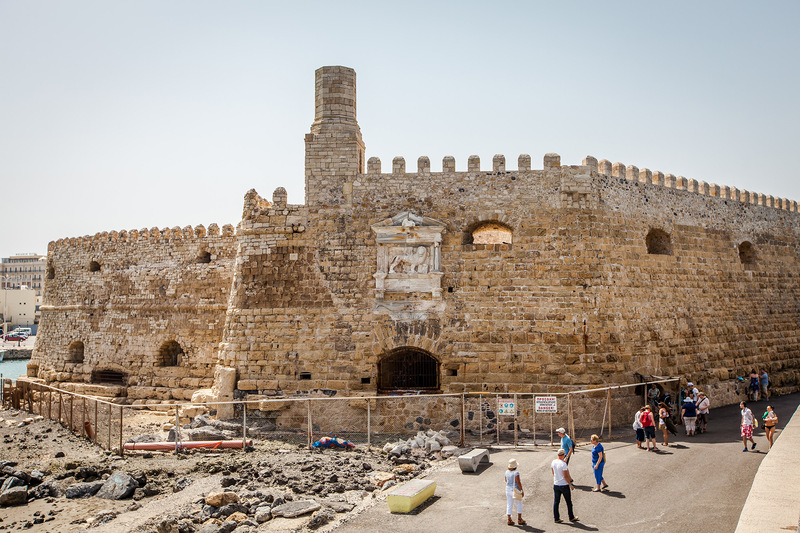 The site was likely used by the Arabs for the fortress they built around 950 AD, but that isn't certain. What is certain is that the location of Koules is the prime defensive position for the old harbor, guarding its mouth and preventing attacking ships from getting at the city. In 1462 Venice's Senate allocated funds for the extensive fortifications Heraklion needed as a result of changing tactics in warfare brought about by the use of gunpowder. Walls needed to be thick, and forts needed to be able to withstand artillery fire. The fort was built on a large tongue of natural rock sticking out into the sea at the harbor's mouth. Its size was 3,600 square meters, or about an acre. Building a fortress this massive is heavy, slow work, and Koules, or the Rocca al Mare fortress, as the Venetians called it, wasn't finished until 1540. The interesting thing is that the fortress did not play a large role in the defense of the city during the 1648-1669 Ottoman siege. The Turks captured the fortress and controlled the harbor entrance fairly early on. The long mole extending out to the east from Koules and forming the north boundary of the new port is a favorite for evening strollers in the summer. On the the harbor front, where the 25th of August St. meets it, are the long masonry sheds of the Venetian arsenals, or shipyards. There were originally 19 of these sheds; 6 remain. Heading east along the waterfront on Leoforos Nearchou, there is a grassy roundabout with a sculpture of 3 leaping dolphins at its center. Continuing east another 150 meters you come to the low, stone, KTEL bus station, from which you can take a bus to anywhere in Crete you desire to go. Heading back west along the waterfront to the roundabout with the dolphins statue, a 300-meter walk west from that point on Mitsotaki Street, which parallels the sea one block inland, will bring you to the Historical Museum of Crete. Closed on Sundays and holidays, the museum in housed in a 3-story mustard-colored neoclassical building built in 1903 and donated to the Society of Cretan Historical Studies as a museum space in 1952. Among the exhibits in its 22 rooms, there is an overview of Cretan history using small exhibits. The main and biggest exhibit is that model of Heraklion about the time of the Ottoman siege in the middle 1600's that I mentioned at the beginning of this post. Other rooms have a numismatic (coins and currency) collection, a reconstruction of a typical Cretan house interior, manuscripts, sculptures, and paintings, included 2 by El Greco. If you find your way back southeast 400 meters to the Leondaria, and remember that you can look at the old city as a clock face, about 400 meters in the direction of 3 o'clock, or east, is one of Greece's best museums, and one of the most important in Europe, the Heraklion Archaeological Museum. The building, dating from the late 1930's, is practically earthquake and bomb proof, having survived both. There are a number of excellent beaches in the area of Heraklion, but nothing right in the city. Let's start with beaches west of Heraklion. Amoudara, 5 km west, is Heraklion's closest beach. This Blue Flag beach has some amenities, but its best features are the golden sand and transparent, aquamarine waters. As is the case with most of Crete's northern shore, winds can be high. There are plenty of accommodations in the area, plus a number of places to eat. Linoperameta, 8 km west, is similar to next door Amoudara. This long, sandy beach has plenty of facilities, and has been awarded the EU's Blue Flag. Tavernas and restaurants are close at hand. For those on a budget, there is a campground close to the beach. Paleokastro, 15 km north and west, is a west-facing beach on a stretch of coastline which runs north-south. This, plus a large rock outcrop to the north of the beach, keeps the waters calm and protected from the strong meltemia, the summer winds coming out of the north. On top of the outcrop, the ruins of an old fort overlook the beach, providing a diversion for those who want to take a break from the sea and sand. East of Heraklion, 3 beaches stacked one after another are on offer. First is Kateros, 8km east. This pleasant, sandy beach offers every amenity, including lodging, bars, taverns, and even fishing. Amnissos, just a kilometer further east of Kateros, can get crowded because it has so much to offer. There are a lot of opportunities for water sports, there is a lifeguard on duty, there are sun beds and umbrellas for rent, and a lot of choices for lodging. As a bonus, there are some Neolithic ruins just inland from the beach, and the Villa of the Lilies, daring from 1600 BC, whose wall frescoes are on display at the Archeological Museum in Heraklion. Four hundred meters offshore, the islet of Dia was an important religious site for the Minoans. In addition, the Cave of Elleithya is close by, where Hera, wife of Zeus, gave birth to Elleithya, goddess of childbirth. Tobrouk, just another kilometer beyond Amnissos, and 10 from Heraklion, is also a beach with a lot of amenities, and is also quite crowded in the summer. Just after Tobrouk are several resorts, starting with Kokkino Hani. Tobrouk is exposed to the north, and can be affected by the strong meltemia winds. Heraklion is well worth seeing even if you do the minimum site-seeing, don't miss the model of the city as it was when it was under siege, and the palace at Knossos just to the south, home of the Minotaur and the labyrinth.